I recently had the pleasure of reading quite a few historic thrillers. It’s kind of a new genre for me but books like The Bookman’s Tale and The Lincoln Myth have piqued my interest and made me want to give the genre a shot . I have also started reading a lot of spy novels as well, so when The Bone Church came around for review I couldn’t resist the unique combo of spy novel and historic thriller! Wartime Prague is the stage where our novel is set. A pair of fugitive lovers, Felix Andel and Magdalena Ruza, make a bargain with a Catholic cardinal in 1956 to smuggle a woman from Czechoslovakia. The other half of this complex tale is set in German-occupied Prague during WWII. Magdalena is a Jew while Felix is a gentile. They work underground as resistance or freedom fighters where there is an assassination plot in the works. With the end of WWII and the Nazi party rule in Prague, it seems like life for the Jews as well as the gypsies, will improve. However a new power is ripe to take over the war torn Eastern European country. The Soviets don’t make things any easier for the Jews and gypsies which is where Magdalena and Felix find themselves. They begin as innocents in the war and end up heavily involved in the resistance as the story goes on. As I mentioned before, the plot moves back and forth giving the reader a lot of information about how the stories are connected and how the characters got to the spot they are in. What ensures is a gritty, non-stop, fast paced, action filled historic thriller. Both the setting and theme of the novel were dark with a touch of paranoia, but to balance that heavy load of reading were the main characters. Both Felix and Magdalena were like beacons of light in a very dark and paranoid world. Both were strong and I admired their resilience. The characters (primary and even secondary) were all very well developed, unique, and interesting. I wanted to know more about them and where they came from. I never felt like I met anyone that was not necessary to the progression of the novel. It was exceptionally helpful that Dougherty provide the chapter headings with dates and locations, otherwise with so much going on I don’t think I could have tracked as well as I did! There is so much action that there is barely any time to notice things like alternation time periods and locations. So well done! I really really really loved this book! It wasn’t your run of the mill historic thriller. There was so much going on from one chapter to the next and the pace was relentless. Felix and Magdalena are always an inch from death and caught in the most extraordinary situations. It’s a wonder that the novel came full circle! I really had to pay attention to what I was reading and focus on the plot–not necessarily over think it, but just focus on what was going on so I didn’t miss any subtle, or not so subtle, cues. This novel has it all….an addictive jaunt into a world of paranoia, deceit, mistrust, and then the ultimate betrayal. While the characters were solid and the pace gripping, the historic references and details were second to none! I loved learning about The Bone Church and all of the WWII tidbits sprinkled throughout the novel were more than satisfying! The reference of The Bone Church comes from a real church where human bones decorate the inside. The church itself in the novel is rich with symbolism and for the audience, it is a returning focal point for the story. It’s difficult to put into words how marvelously this church was at creating rich symbolism and foreshadowing in this novel….one reviewer described it was a “constant reminder of impermanence and mortality” and I would wholeheartedly agree. This novel was truly a treat for me to review. There was a lot to keep me guessing and actively engaged. I was annoyed beyond words when I had to put it down because I simply needed to know what was coming next. It never gave up or became dull….it was a thriller in every sense of the word! 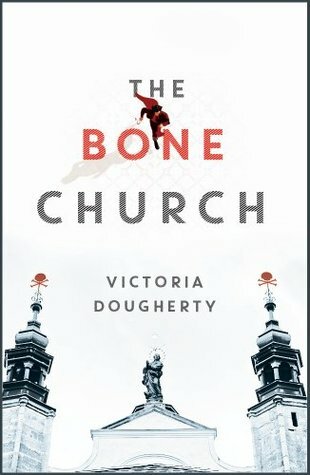 I reviewed this book as part of The Bone Church by Victoria Dougherty virtual book tour hosted by Historical Fiction Virtual Book Tours. Be sure to visit the other blog stops on the tour for interviews and giveaways! thank you so much for having me on and for such a wonderful review. I can’t tell you how happy I am that you enjoyed The Bone Church. I swear I wrote it with my blood! Have a great summer! Sounds exciting and I love the time period too! Can’t wait to read it!